Lil Jon is known to the hip-hop world as the "King of Crunk," a superstar rapper and producer. What they probably don't know is he started out as a dancehall selecta or deejay, as a member of the Four Seasons Sound System during the '90s, in his hometown of Atlanta. Now the entertainer, formally known as Jonathan Smith, is coming full circle, flirting with his love of Caribbean music by injecting his unique crunk flavor into this year's Carnival festivities in Trinidad. Jon will not only be performing, but he has actually produced a beat for a collaboration between him, Latin hip-hop star Pitbull, and soca artist Machel Montano, called "Floor On Fire." The success of the production has evolved the track into a full-fledged riddim, with numerous Caribbean stars voicing on it, including Kevin Lyttle and Mr. Vegas. As a result, a new breed of soca is being introduced and will see its debut on soca's most prolific stage - Trinidad Carnival. This is not the first major stage on which Jon has displayed his flair for island beats. He first appeared alongside Pitbull and Machel Montano at soca's other big festival, Crop Over in Barbados, last August. He was also in Trinidad recently to kick off Carnival, performing with Montano at the annual WASA Fete on January 31. "At Crop Over, we decided we would do another collaboration - but something fresh and from scratch. I went home, did the beat, sent it to Pitbull and Machel, and this time we also got into the studio together and the rest is history. Now with 'Floor On Fire,' dirty soca is born." Jon's vision is to not merely spread the new flavas from fete to fete, but his goals are to bring international and mainstream attention to Caribbean music, in all its forms. His blueprint for this dynamic undertaking plots collaborations with soca, dancehall, reggae and Latin entertainers, and sees him trekking throughout the islands and also working the international circuit that celebrates Caribbean music. As for his love for Caribbean music, Jon is drawn to the energy found within. "I like how it takes the party to another level," says Jon, of his first taste as a deejay. "The energy of the music would have all the girls partying and getting crazy - it's always a fun experience." 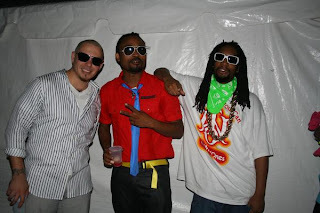 Longtime industry playmaker DJ Buddha, music consultant to Jon and A&R to Pitbull, introduced the trio and is responsible for the fusion of sounds. "My interest falls in bringing good music to the masses and being able to expose our culture and brand to the world," reveals DJ Buddha. " I want people to understand that a lot of the music they know and love originated in the Caribbean, such as reggae, soca, calypso, hip-hop, reggaeton, merengue, salsa, and are fused from these small countries and rich cultures." A virgin to TNT Carnival, Jon is excited to be included in this year's history. "I hear it's the biggest, best and wildest carnival in the world." He is also using the trip as an opportunity to shoot the video for the hit single, "Floor On Fire." "I want to capture the true essence of the culture, and therefore shoot the video at AC7, and on Carnival Monday and Tuesday," states the star. "I want to visually bring to the worldwide audience the energy of Carnival!" The single will be featured on his upcoming album, Crunk Rock, due out this summer from Universal Republic Records.